Why Do We Care About Nutrition Investment? Because increased funding for nutrition means gains in healthy and productive life years: global estimates state that for every USD $1 spent on nutrition, countries can save USD $18 of that cost through improved health and economic benefits. SPRING’s PBN study took a 360-degree view of the planning process by interviewing stakeholders from the government, donors, UN groups, civil society, private sector, and academia, at the national level and in selected districts in Nepal and Uganda. The studies used a longitudinal mixed-methods design during a two-year period. Ministry of Finance databases on extra-budgetary funding (“Off-Budget”, EDP funding only). SPRING conducted in-depth validation with stakeholders for each fiscal year. Analysis applied central bank inflation rates and exchange rates to provide figures in current year local currency and USD. developed a nutrition budgeting analysis tool and user’s guide that provides background information, step-by-step guidance, and an excel-based template for undertaking the budget analysis process. The tool can be used across multiple ministries or donors to provide a more comprehensive picture of national nutrition allocations, or can be used within a single organization. 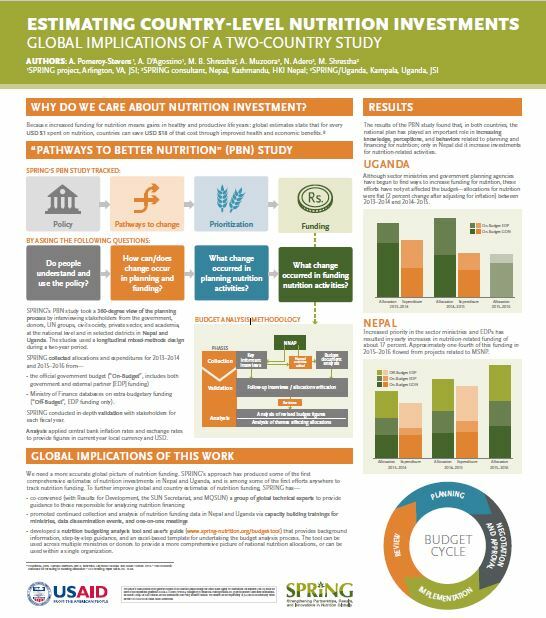 The results of the PBN study found that, in both countries, the national plan has played an important role in increasing knowledge, perceptions, and behaviors related to planning and financing for nutrition; only in Nepal did it increase investments for nutrition-related activities. Although sector ministries and government planning agencies have begun to find ways to increase funding for nutrition, these efforts have not yet affected the budget—allocations for nutrition were flat (2 percent change after adjusting for inflation) between 2013–2014 and 2014–2015. Increased priority in the sector ministries and EDPs has resulted in yearly increases in nutrition-related funding of about 17 percent. Approximately one-fourth of this funding in 2015–2016 flowed from projects related to MSNP.